Depending on mood, he’d eat his dinner al fresco. Tonight, it was risotto while prone on the river rock; tomorrow, soup while squatting on the concrete. 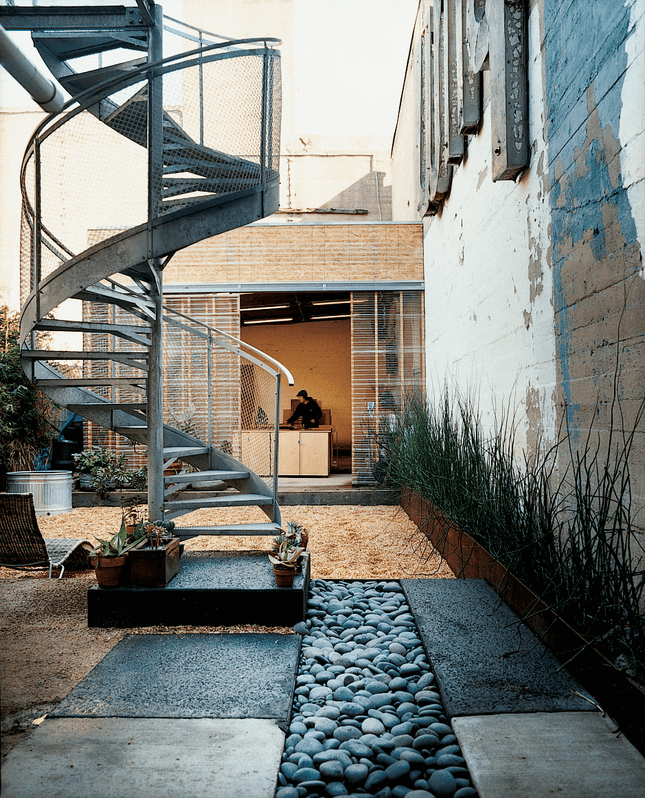 A staircase leading to nowhere takes the central focus of this wonderful outdoor space. Serving as nothing more than a decorative adornment accentuating the post-modern styling of this area, it makes for the perfect addition to this modern garden. The colors are emulated wonderfully across the stones used in the central region of this space, while also pairing with the tiles and signage equally as well. A weathered look has been left on the wall, offsetting the definitive design of the rest of the garden in such a way that the cutting-edge components blend seamlessly into the natural aesthetics. Bordering the border wall is an elongated planting box bringing greenery to the entire area. The grass is left to grow which is a wonderful offset to the cold, steel staircase and modern shutter blinds at the entrance to this home. The wooden interior and browns of the blinds are well-matched by the gravel laden ground cover filling most of this long garden. Provision for additional plants as highlights to the area, balancing out the greenery of the grass, work wonderfully, as does the steel framework supporting the blinds and framing the brickwork of the entrance. The designer of this space has brought about a balance to be proud of.